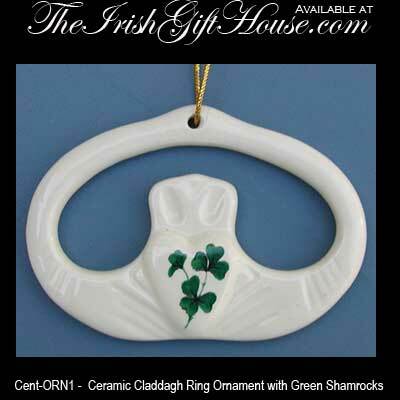 Sorry, this Claddagh ornament is now sold out. with Hand-painted Green Shamrocks and the Claddagh Legend Hang Tag. 2.75" Wide x 2" Tall, Gift Boxed. The Claddagh Ring was designed by artist Richard Joyce in the 16th century in the village of Claddagh near Galway, Ireland. The heart stands for love, the crown stands for loyalty and the hands for friendship.